Pyroclastic density currents are hot, fast moving "clouds" of gas, ash, and rock debris known as tephra. They can reach temperatures up to 1,000 degrees Celsius and speeds of 700 kilometers per hour and are much denser than the surrounding air. Therefore, driven by gravity, they tend to hug the ground as they flow rather than creating a plume in the air. They can have even more energy if initiated by a "lateral blast" of the volcano. 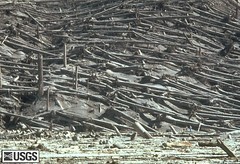 Images of the snapped, stripped, and stacked logs after the 1980 Mount St. Helens eruption vividly illustrate the power of a blast-enhanced pyroclastic flow. Pyroclastic density currents are most hazardous on, and immediately surrounding, the volcanic edifice. 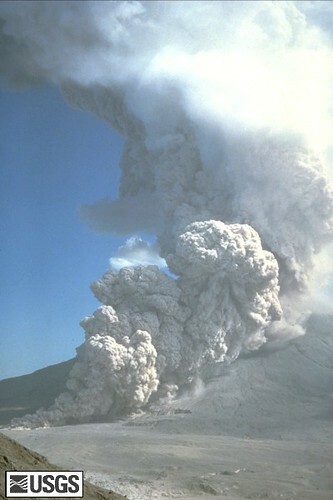 The best way to keep safe from is keep distant from the mountain during periods of unrest, when authorities are concered about possible eruption. Map C from the Cascade Volcano Observatory shows the worst case scenario reach of a lateral blast from Mount Rainier like that of Mount St. Helens. As you can see it is mainly contained in the National Park boundaries.